I just got these great socks from Gama Family. These are really fun and vibrant. You get a set of socks that have compound words on them. So one sock has the first half of the work the other sock has the other half of the work. The socks don’t really match, they look completely different which is super in style right now. My daughters do this all the time will mix up their socks and wear two completely different socks so they already do this for you here. 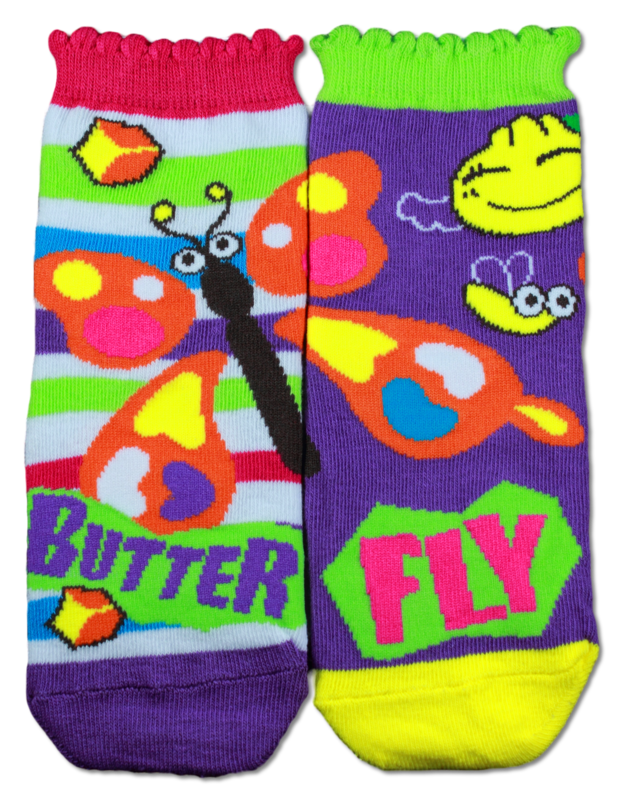 There is a picture of the compound word item on the socks though so you can fit them together and they make a picture, like the one we got had a butterfly that lay across the two socks. The socks are constructed well, very well made, seams are well done. They fit well, I got them for my 6 year old and they fit her great. Lot’s of fun, plus they can learn while matching their socks. Really cute idea! Free Exclusive App Included — Complete compound word learning with our interactive app! It’s free to download on either iPad, iPhone, Android or Kindle Fire devices. Search “Compound Words with Gama”. Works as Educational Tool — A great way to teach your child with pictures and words on socks. Teach word Star/Fish/Starfish. Each sock has a word and illustration printed on it. Match them up to reveal the correct compound word and complete the image. Learn Left and Right — Your child will learn and know which one goes on the right and which one goes on the left. When he/she does it right, the compound word picture will show. Kid-Friendly Colorful Fashion Short Crew Designs — All of our socks feature lively and easily recognizable kid-friendly designs. Comfortable — Our socks are made out of a breathable cotton and nylon blend for all day comfort! They can also stretch higher up for upcoming cold weather.